Experienced part programmers can access functions such as data storage/ retrieval to floppy disc, non-volatile flash disc and network connections. Background functions allow for rapid new tool creation, work piece definition and the fine tuning of machine parameters to respond to any environment. 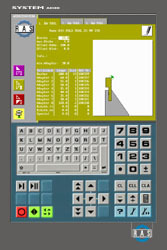 Emulated software allows for off-line programming and training. Diagnostic capabilities provide service staff with status definitions and machine element monitoring. The communications properties of the control allow for remote debugging and fault exposure. A custom embedded solution gives machine builders the ability to lock-in their knowledge and create the seamless machine. This empowers manufacturers to create products with powerful sales advantages. If you have a new machine development, we would be delighted to talk to you about making it stand out from the crowd at your next machine fair.